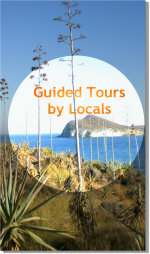 I don’t want you to get the wrong impression about Spain and particularly Almeria Province. The food here isn’t just paella, tortilla and gazpacho, as one may have come to expect. The food in Spain is much more imaginative than one may think and of course we also offer a wide range of cosmopolitan foods originating from many other countries, such as Chinese, Japanese, North African and all areas of Europe as well as other parts of Asia. This weekend I made a dish (using lentils and chorizo) with a Moorish influence. The thing is, I have been researching the 'Moors influence on Spanish foods' for a new gastronomic and cultural tour I have been asked to create and host in Almeria City, and so it was a great opportunity to broaden my knowledge base and limited culinary skills in the kitchen. I purposely chose an easy dish with which to kindle my re-acquaintance with the kitchen after an unusually long absence. The dish was delicious and my friends were suitably impressed, but what was so impressive for me was that it was wholesome, filling, healthy and inexpensive to produce. 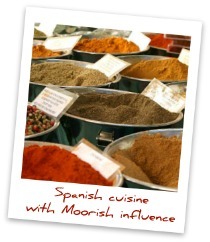 The research findings were fascinating and during the next few months as the tour unfolds I’ll reveal other Moorish dishes and influences through a number of mouth-watering recipes. ( The lentils recipe is available here ). Give it a try!